HOW LONG DOES DISC REPLACEMENT SURGERY TAKE? THE LENGTH OF time it takes to complete Artificial Disc Replacement surgery can vary significantly depending on the skill and experience of the surgeon and the surgical team. The typical spinal surgeon who performs ADR a few times a month may take two or more hours for a single-level ADR procedure. On the other hand, if the surgery is being performed by a highly experienced surgeon and team, this time falls considerably. At our hospital, where we perform multiple ADR surgeries every week, a single-level ADR takes approximately one hour and 15 minutes. A multi-level disc replacement is usually accomplished within 90 minutes. Even a hybrid procedure, where ADR and fusion are combined, takes our team only about 90-120 minutes, largely because of our experience and skill with these procedures. This is very important if you or a loved one are considering spinal surgery. The amount of time you spend in surgery is critical to your recovery. The longer you are in surgery, the higher the chance for problems and complications. The shorter your surgery, the less blood loss you may sustain, the less time you are under anesthesia, and the lower your chance of infection. It stands to reason that the chance of infection increases the longer your surgery is underway. The sooner your wounds are closed and sutured, the better. You want to be exposed to potential complications for as little time as possible. The short surgery times at our hospital are one of the reasons we have a very low infection rate. Our general infection rate is 1.8%, far below the average surgical suite. Hospital infection rates are carefully monitored in Germany, and tracking is mandated by law. The truth is, we have never had an instance of a primary infection following disc replacement surgery. While we have had the inevitable low-grade infections in a few cases, the occurrence has been less than 1 in 1,000. WHERE CAN I GET ADR OR HYBRID INTERVENTION PERFORMED? Unfortunately, your access to Artificial Disc Replacement and hybrid intervention may be hampered by your location. While ADR has been performed for decades in other parts of the world, the U.S. and Canada have been slow in coming up to speed with the procedures. This is not due to any specific problems with ADR or hybrid intervention but simply because of the regulatory processes and medical systems in these countries. Meanwhile, the Spinal Kinetics M6 Implant, for instance, is used in 27 countries around the world, and over 43,000 devices have been implanted since it was released in 2006. I had the honor of being the first surgeon ever to implant the M6-L (lumbar) artificial disc, and I have implanted thousands of them since. I was also the first surgeon in Europe to implant the M6-C (cervical) disc. Fortunately, FDA testing is now underway for its use in the U.S. While it may be still several years before the device sees widespread use in the states, it seems highly likely that the Spinal Kinetics M6 will become a valid treatment option for people there. 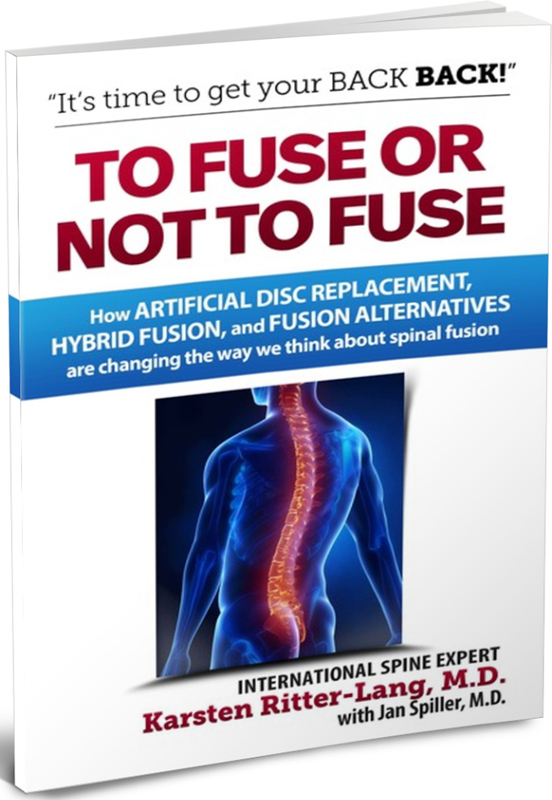 The remaining level(s) must instead be fused, even when an additional level of disc replacement might be the best solution. While this is often better than all of the injured levels being fused, it does not compare well to the restored function and decreased pain that we see with multi-level disc replacement. There may come a time soon when multi-level ADR will be common in the U.S. and Canada, but, for now, surgeons in these countries are sadly limited in their treatment options. Even though the M6 (which is actually made in the U.S.), is going through the FDA approval process, my sources indicate that, even when it is approved, it will still only be approved for single-level use. Frankly, common multi-level use of state-of-the-art artificial discs may be a decade or more away in North America. By the time the FDA has given approval for multi-level ADR with the M6, the state of the art may have advanced to other disc implants and techniques. For these reasons, patients often travel outside North America for disc replacement. To get the best possible treatment, they engage in what some call “medical tourism.” This term doesn’t describe getting treatment while on vacation; instead it refers to a more and more common practice of traveling to the part of the world that holds the best solution. Many people who own a car will seek out the “best” mechanic. How you personally determine which mechanic is “best” may vary, but many people will consider the mechanic’s experience working on their model of car, the mechanic’s state-of-the-art diagnostic equipment, and repair options. Price also may come into consideration. Well, the best mechanic for your car may not have his shop in your neighborhood. You might have to drive across town to seek repairs if you want “the best. This is true for medical treatment too. The best medical solution may not be available in your neighborhood…or nation. By one estimate, 1.4 million people engaged in medical tourism in 2016. (Patients Beyond Borders, 2016) Whether they travelled for different treatment options, better care, or more affordable treatment, they all left their “neighborhood” and drove “across town” for medical care. In the case of spinal surgery options, the best surgeon, surgical team, hospital and devices may not be available where you live. Traveling abroad may be required. Disc replacement has been performed for many years in Germany. While disc replacement may be available in other countries, it is my belief that spine treatment options in Germany are excellent. High levels of care, low infection rates, and state-of-the-art devices make Germany a very attractive alternative for disc replacement and spinal surgery in general.